DeWitt worked to develop and implement membership strategies, plan events, and manage member benefits, appeals, and renewals. She also assisted the director of marketing with marketing initiatives, including graphic design and promotional partnerships. Enter to win two tickets to "Boundless," the opening celebration for "Radical Transformation: Magnum Photos into the Digital Age." The galleries are being prepared for the Ransom Center’s upcoming exhibition, Radical Transformation: Magnum Photos into the Digital Age. 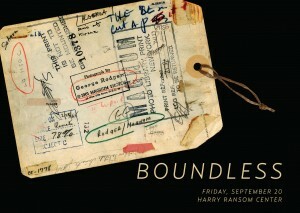 Join us for “Boundless,” the opening celebration for the exhibition from 7 to 9 p.m. on Friday, September 20. Enjoy a signature champagne cocktail and hors d’oeuvres at this reception and pose in our photo booth inspired by the golden age of travel. Guests will also have the opportunity to enter to win an exclusive prize package that includes a dinner for two at Uchi, a two-night stay at Hotel San Jose, a handcrafted vintage suitcase, and more. DeeJay jLa will be playing records from the ‘50s and ‘60s, the era of Magnum Photo’s founding, on the plaza. Be among the first to explore the exhibition, which chronicles the evolution of Magnum Photos, the iconic photography cooperative. Magnum photographers have produced some of the most memorable images of the last century, shaping history and revolutionizing photography’s influence on modern culture. Ransom Center members receive complimentary entry and valet parking at this celebration. If you are not yet a member, tickets to the opening will be available for $20 at the door (valet parking is not included for non-members). The Ransom Center is giving away a pair of tickets to “Boundless.” Email hrcgiveaway@gmail.com with your favorite travel destination in the subject line by midnight CST tonight to be entered in a drawing for complimentary admission for two. The winner will be notified by email. Arnold Newman, "Marilyn Monroe and Carl Sandburg" (Detail), 1962. © Arnold Newman/Getty Images. The galleries are being transformed in preparation for the Ransom Center’s new photography exhibition Arnold Newman: Masterclass. We hope you will join us for “Face to Face,” the opening celebration for the exhibition from 7 to 9 p.m. on Friday, February 15. Sip on refreshments from Austin Wine Merchant and Dripping Springs Vodka, pose in an Arnold Newman-inspired analog photo booth created by the Lomography Gallery Store, enjoy treats at The Cupcake Bar’s dessert station, and view screenings of Arnold Newman interviews and film clips. Be among the first to explore photographer Arnold Newman’s iconic portraits of celebrities and cultural figures including John F. Kennedy, Salvador Dalí, Ansel Adams, and Pablo Picasso, among others. Newman’s archive resides at the Ransom Center. Guests will have the opportunity to enter a drawing for a Newman-inspired prize package that includes brunch for two at Fonda San Miguel, a stay at the Heywood Hotel in East Austin, a darkroom class with photographer Anthony Maddaloni, a Lomography camera, a membership to Austin Center for Photography, and more. Ransom Center members enjoy complimentary admission and valet parking at this event. If you are not yet a member, you may join or order individual $20 tickets at the door. Tickets are also available online until Friday, February 8. Valet parking is not included for non-members. 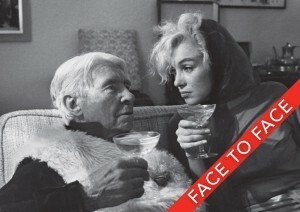 The Ransom Center is giving away a pair of tickets to “Face to Face.” Email hrcgiveaway@gmail.com with “Arnold Newman” in the subject line by midnight CST tonight to be entered in a drawing for complimentary admission for two. The winner will be notified by email on Monday, February 11. Special thanks to these sponsors: Anthony Maddaloni Photography, Austin Center for Photography, Austin Wine Merchant, Dripping Springs Vodka, Fonda San Miguel, Heywood Hotel, Lomography Gallery Store, and Thames & Hudson.